Most of us are familiar with the advantages of a light flywheel. A light flywheel robs less power from the engine, as an engine accelerates through its rev range; a flywheel’s mass requires power to accelerate it to higher rpm. A lighter flywheel frees up the engines power that would be spent spooling up the heavy flywheel, so although a flywheel doesn’t actually make more power, it allows more power to reach the wheels. 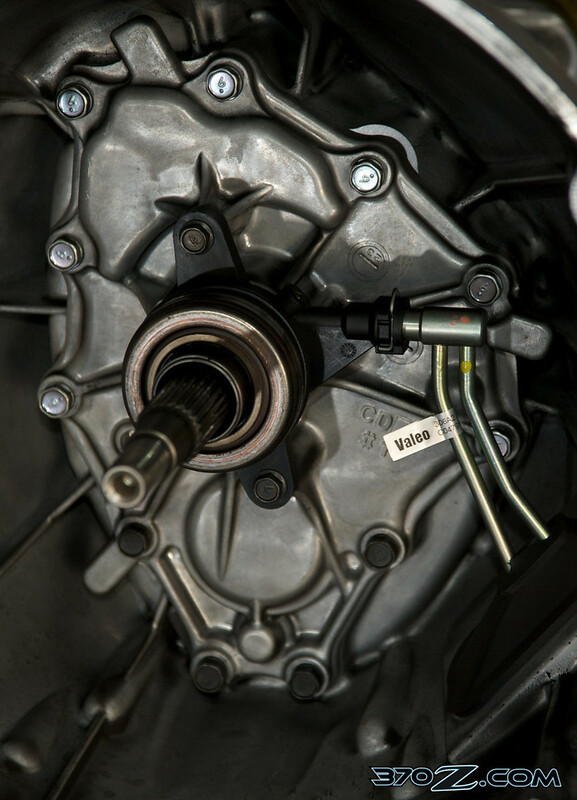 A light flywheel also allows the revs of the input shaft to fall slightly quicker during shifts, unloading it, making work for the transmission’s synchronizers a little easier, speeding shifting and extending syncro life. From a performance standpoint, the Nissan 370Z probably is one of the best candidates for performance improvement from a flywheel because of its extremely heavy stock clutch and flywheel. 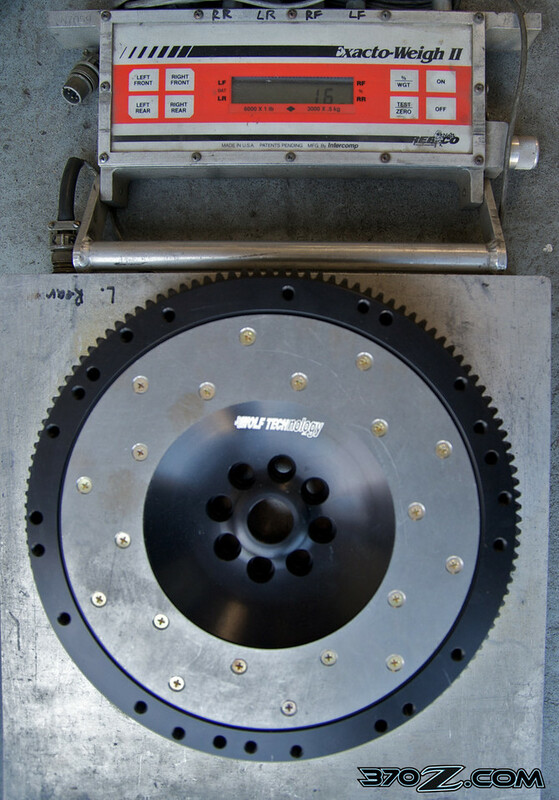 The stock flywheel weighs a stout 32 lbs, the pressure plate 16 lbs and the clutch disc 3 lbs. That’s 51 lbs of rotating weight that must be spun to speed at the end of the crankshaft! Why is the stock 370Z’s flywheel so weighty? In an effort to reduce NVH (That’s engineers speak for Noise Vibration and Harshness) to extremely low levels, Nissan made the stock flywheel very heavy. The heaviness of the flywheel helps to smooth out power impulses of the VQ37VHR engine. This makes the engine feel smoother, like a V8 and also reduces the pulses that create the harmonic that can cause transmission input shaft rattle. 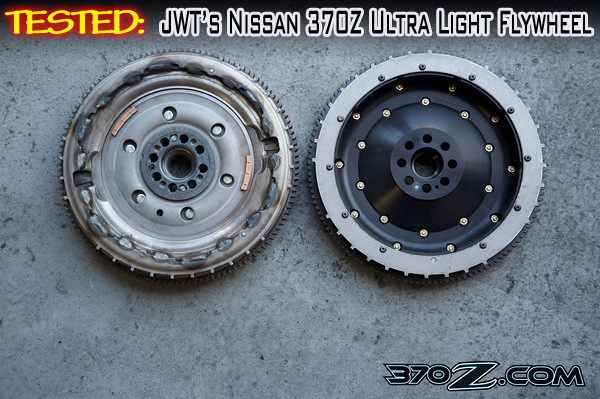 To further damp out vibrations the 370Z’s flywheel is what’s called a dual mass flywheel. 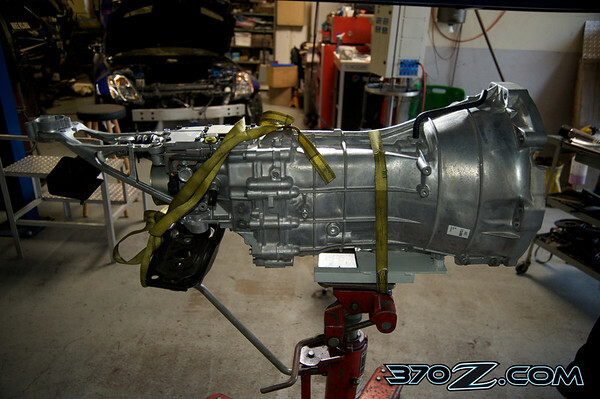 First introduced on the VQ35DE engine found in the 350Z, the flywheel is a two piece affair; one part is attached to the crank and the other half which contacts the clutch disc, has most of its mass on the rim. This side of the flywheel floats freely from the crank on a sleeve bearing, constrained by springs. 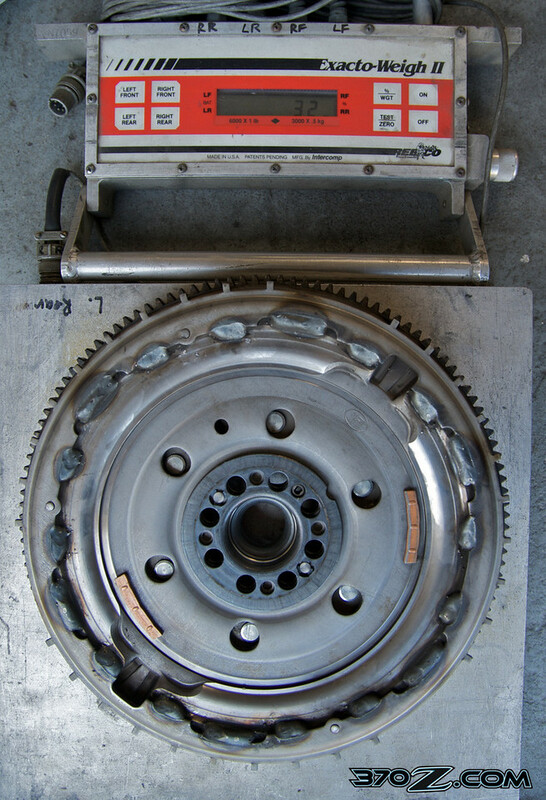 The free floating part of the flywheel is designed to act as a mass damper and is tuned to damp out low rpm vibrations. This technology is usually reserved to smooth out the strong power impulses of diesel engines but Nissan is using this on the VQ37VHR. I've been really pleased with my JWT FW/Stage 2 Clutch on my V35C's VQ35DE, it really opened up the rev happy on the motor esp now with ECU changes. Mine was an older '04 and was capped at 6850 cutoff, I raised to 7400 and it's smooth to 7200 easily. It's so responsive w/o the boat anchor and minimal chatter at idle. Curious to see that the dual mass FW for the 370 weighs in a 32 lbs, same as last gen, but the new JWT weighs in at 16, which is heavier by 3-5 lbs than the VQ35 version?